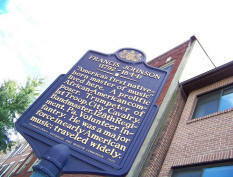 Francis Johnson (1792-1844) "'America's first native-born master of music' lived here. A prolific African-American composer. Trumpeter of First Troop, City Cavalry. Bandmaster 178th Regiment, Pa. Volunteer Infantry. He was a major force in early American music; traveled widely." Home -> Musicians -> Johnson, Francis B. "Frank"
Francis (or Frank) Johnson was the first major bandmaster in the U.S. It has long been thought he was born in Martinique, but it is now believed he was born in Philadelphia, known there as a professional musician by 1812, probably as a violinist. Francis Johnson played the bugle, keyed bugle, cornet, violin and other instruments. He also composed music for band. Among the recordings of his works is The Music of Francis Johnson and His Contemporaries: Early 19th-Century Black Composers, Music Masters 7029-2-C (1990). The music is performed on original instruments by The Chestnut Brass Company and Friends, accompanied on violin by Diane Monroe and led by Tamara Brooks, Conductor. The CD includes marches and dances of the period by Johnson's four African American contemporaries in Philadelphia who also wrote band music: James Hemmenway, Isaac Hazzard, A.J.R. Conner and Edward Roland. The career and musical legacy of Francis "Frank" Johnson (1792-1844) represent one of the most singular achievements in the history of American music. In an era when full-time musicians were a rarity in the United States, Johnson fashioned a career of such variety and importance that it would be the envy of many a modern musician. Even more remarkable is that Johnson, an African-American, was able to achieve such success against a background of racial strife which worsened even as his work progressed. 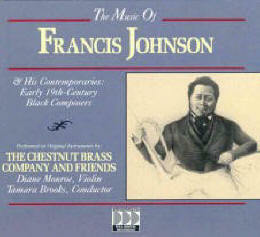 Johnson was the composer of over three hundred pieces of music, the majority of which were published. He was a renowned performer on the keyed bugle and violin and led one of the best bands of his time. The sources of his musical training are likewise a mystery, though some of his study appears to have been with Richard Willis, an Irish keyed-bugle soloist who arrived in the United States in 1816 and assumed leadership of the West Point band in 1818. The keyed bugle, which Johnson played by 1818, was patented in 1810 by Joseph Halliday, an Irish bandmaster. It was also known as the Kent bugle, named for the Duke of Kent who called for its use in the royal bands. By 1818, the year of his first published composition, A Collection of New Cotillions, Johnson was established as a well-known musician in Philadelphia, then the national cultural center. Robert Waln, author of The Hermit in America, penned the following oft-quoted portrait of Johnson in 1819: "In fine, he is the leader of the band at all balls, public and private; sole director of all serenades, acceptable and unacceptable; inventor-general of cotillions; to which add, a remarkable taste in distorting a sentimental, simple, and beautiful song, into a reel, jig or country-dance." Johnson's band, which probably was begun to fill a need in the Black community, shortly became popular with the more affluent White society as well. Two important, long-standing associations were formed in the early 1820s when the band became affiliated with the Philadelphia State Fencibles (militia units at the time contracted with their own bands) and with the Summer Resort at Saratoga Springs, presaging the current summer residency of the Philadelphia Orchestra. In 1824 Johnson's reputation was further enhanced when he composed much of the music for the triumphal return to Philadelphia of Revolutionary War hero General Lafayette, who was traveling the United States to great public acclaim and celebration. A band of 20 players provided music for most of the festivities accorded General Lafayette in 1824. Francis Johnson's music for General Lafayette on this recording includes: Honor To The Brave: Gen. Lafayette's Grand March (3:57). so, even if rather short individually, the performances became extended. In 1837 Francis Johnson announced that he and a small contingent of his band members were departing for Europe to "improve his musical capacity and knowledge, so as to be able in a much greater degree than formerly to contribute to the gratification of the public." In November of 1837, he took William Appo (Johnson's brother-in-law), Aaron J. R. Connor, Edwin Roland, and Francis V. Seymour (if not also James Hemmmenway) to London as the first Black American musicians to visit Europe, and to the royal court at Buckingham Palace to play for Victoria (1838), soon to be crowned Queen of England. The musicians remained in Europe, acquiring music, studying continental styles and giving concerts until their return to the United States for the Christmas season of 1838. Upon their return they promptly introduced Johnson's tremendously successful Promenade Concerts a la Musard, forerunners of the modern "pops" concerts. Prominent White performers were later included in these programs, some of the first interracial performances in America. In 1842 Johnson provided the music for a ball in honor of the visiting English author Charles Dickens. His tours (1839-1844) took him as far north as Toronto, as far west as St. Louis. They also performed in Detroit, Ann Arbor, Cleveland, and Louisville. As free Blacks, Johnson and his band members found themselves unwelcome in Missouri, which had entered the Union as a slave state. Johnson remained musically active in the Black community as well, often conducting the orchestra at church concerts, including works by Haydn and Handel. His pride in, and commitment to, his race is manifest in many of his works, notably the Recognition March on the Independence Hayti and the music to the moving abolitionist song The Grave of the Slave. Johnson's career was never far from the ugliest forms of racial persecution. White bands often refused to participate in parades when Johnson's band was scheduled to appear; and when the band toured to St. Louis, Missouri, its members were arraigned, fined and ordered from the state under laws prohibiting the entry of free Blacks. A particularly violent incident occurred near Pittsburgh: "At the close of the concert the mob followed Mr. Johnson and his company shouting "n____" and other opprobrious epithets, and hurling brick-bats, stones and rotten eggs in great profusion upon the unfortunate performers. One poor fellow was severely, it is feared dangerously, wounded in the head, and others were more or less hurt. No thanks to the mobocrats that life was not taken, for they hurled their missiles with murderous recklessness if not with murderous intention." The Tribune [NY], May 23, 1843. Johnson died in 1844 after a sustained illness. The seriousness of his condition somewhat restricted his concert acivities, but spurred a final burst of compositional productivity, perhaps to generate income for his wife and family and perhaps as well to commit as many of his ideas to paper as possible. His funeral was attended by hundreds of members of the African-American community; and his own composition, Dirge, was played by his band at his grave. His ensembles continued after his death, now known as the Frank Johnson String and Brass Bands, led by Joseph G. Anderson (1816-1873), disbanded about the time of the American Civil War. 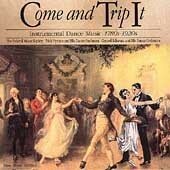 Come and Trip It - Instrumental Dance Music, New World Records NW 80293 (1997) features two works by Francis johnson, Victoria Galop (1:08) and La Sonnambula Quadrille No. 2 (4:32). Three pieces by Johnson can be found on Those Fabulous Americans, Troy 103: The Philadelphia Gray's Quickstep, The Princeton Grand March and Johnson's March. Matthew Phillips conducts the Symphony Orchestra of America. Hidden in Plain Sight: Musical Treasures in the Penn Library is an exhibit curated by Marjorie Hassen at the Music Library of the University of Pennsylvania. It contains a signed manuscript copy of two compositions of Francis Johnson, Favorite Waltz, or Spanish Dance and Favorite Hop Waltz arranged for the piano, "for Mrs. J. Reed". Francis Johnson is best remembered as progenitor of the Nation's music of martial ardor, inventor of cotillions, a pioneer, and one of the earliest protagonists of American musical purism. He was a quintessential American musical phenomenon. I ask my colleagues to join me in remembering Francis "Frank" Johnson on the anniversary of his birth and always. This site is an excellent resource for exposing the public to music history. This has been a huge help in planning for our current core exhibit, which explores the lives of African Americans in Philadelphia 1776-1876. Chestnut Brass Company & Friends (1990/02). CD: MusicMasters MMD 6 0236 F.
Francis [1:36]; Fort Erie [2:03]; The arrival [1:35]; Castillian [1:22]. Philadelphia: George Willig, 1818. David Anthony Lofton, piano. LP: Parallelodrome (1989). CBMR (Aaron Horne). for the Author, 1824 (Johnson's new cotillions and march). Johnson's dream waltz (1826). Duration: 2:24. LP: Opus One 39 (1978). CBMR (Lerma). Johnson’s march. Philadelphia: George Willig, 181?. Symphony Orchestra of America; Matthew H. Philips, conductor. CD: Albany TROY 103 (Those fabulous Americans). LP: Desto DC-6445/7 (1975). CBMR (Lerma). Philadelphia fireman's cotillion. New York: G. E. Blake, n.d. Recognition march on the independence of Hayti (c1804). Black Music Repertory Ensemble; Kay George Roberts, conductor; arr.